Enjoy relaxing in the den! South beach just a short bike/bus ride away. Enjoy this family friendly retreat located on the bike path to South Beach and walking distance to downtown Edgartown. It is the perfect location to enjoy all that Martha's Vineyard has to offer. The house is on the #8 VTA bus route between Edgartown and South Beach, providing connections to the rest of the Island as well. Imagine returning from a day at the beach to relax with a drink enjoying the breeze on the back deck. While grilling on the deck, you can overlook the large backyard where your children are playing. 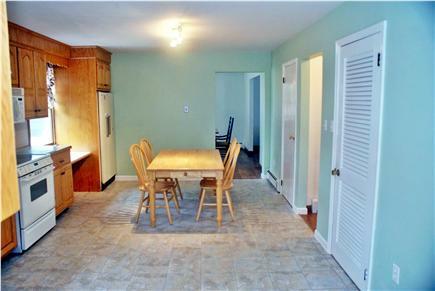 If you choose not to take advantage of close by restaurants, our large eat in kitchen will be available with its modern conveniences - microwave, toaster, coffee pot, dishwasher, booster seat, and large lobster pot. If you prefer a separate eating space, enjoy dinner in the dining room with sliding glass door overlooking the back deck. You may also just choose to relax with a book in the den, or sit and talk with friends or watch TV in the living room. Upstairs are 4 bedrooms. The master bedroom offers a king size bed and full bath (shower stall). There are 3 additional bedrooms, one with a queen size bed, one with a full size bed and one with 2 twin beds. 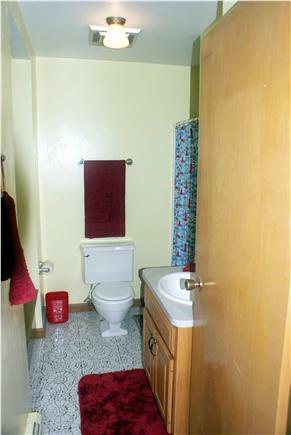 There is a shared hallway and full bathroom with linen closet. All bedrooms are large with large closets. For those small guests, there is a gate that may be placed at the top of the stairs. A beautiful house with plenty of room for everyone, spacious rooms, and beautiful yard. Great location with easy access to the buses for convenient transportation to South Beach and connection for buses to Oak Bluffs, Vineyard Haven, and others townships on the island. Thank you for sharing your home; we stayed for three weeks and had an exciting vacation. If you plan on using the Katama bike path and spending your days at South Beach this is just the location for you. The house was very clean and the kitchen was big and easy to cook in. Here are things to be aware of. The house is hot. There are only ceiling fans in the bedrooms and in one room on the first floor. The living room, dining room and kitchen have nothing. We went out and bought fans to make it livable. The other issue with the house is comfort - the couches are old and very uncomfortable as are the beds. We are happy to hear that you liked the location and the kitchen. We are sorry that you found the house hot. We do not have air conditioning, and there are weeks during the summer that can be unexpectedly hot. You had a week with temperatures in the mid 90’s which is very unusual. I also believe you were there before the sliding screen door to the back deck was fixed, which greatly affects the air flow and breezes through the house. We do have fans in all bedrooms to make sleeping more comfortable when it is hot. In regards to the mattresses, they were all purchased in 2012. We will take under advisement adding some extra padding with the sheets and mattress pad to give an extra layer from the mattress protector. We are trying to make some improvements to the furniture and the house, however with trying to keep rental costs low for families to enjoy the location, they may not come as quickly as we and some renters would prefer. We appreciate your honesty and hope that others find this useful. 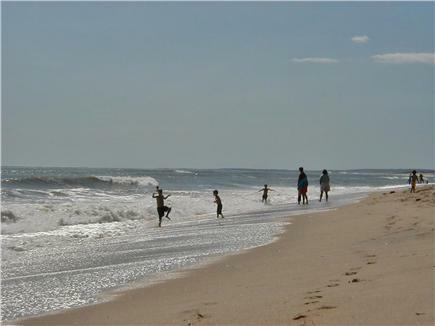 When we are on the Vineyard we spend little time in the house and many hours enjoying the beach and the island. We hope others will find the location and memories made here worth the minor inconveniences. My family had a wonderful time at Anne Marie's house. Plenty of room for a group of 4, including kids. The best part about the house is the proximity to downtown Edgartown and the beaches. 15-20 minute walk to the restaurants, shops, and bars. Very short drive to South Beach. I'd definitely go back. I'deal location with close proximity to downtown Edgartown where there are many wonderful restaurants. Also close to South Beach which in my opinion is one of the best beaches in the world. The general store is close by within walking distance. The home itself is very clean and very accommodating. Can't wait to return. There was more than enough room. It met our needs wonderfully. I wish there were ceiling fans in the TV & Dining rooms, but we managed. The management company was very attentive. They replaced blown bulbs right away, they ensured we had enough propane for the outdoor grill and the place was clean by professionals. The beach was close. Everyone had a great time, Thanks! My family and I had another fantastic vacation! The location is perfect, close to everything! The home is clean, comfy and large! We all can't wait to return again next year! Our parents lived here year round until December 2011 when they moved to be closer to grandchildren. We have enjoyed vacationing here for the past 14 years and did not want to lose that opportunity. We decided to share our joy with others. We hope you enjoy it too! An easy 15 minute walk to downtown Edgartown. Katama General store is a 5 minute walk. Bike path in front of house makes an easy ride to South Beach 2 miles away.